Vain is the Help of Man. The Rt. Rev. 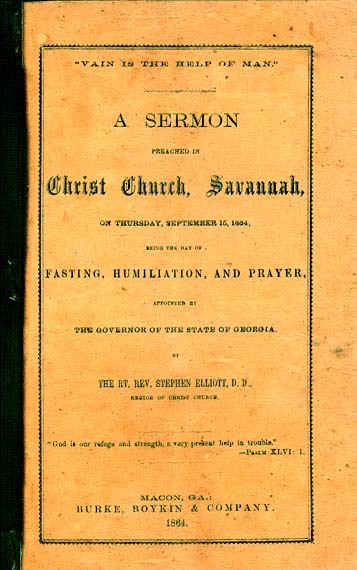 Stephen Elliott, D. D.
Fast-day sermons -- Georgia -- Savannah. 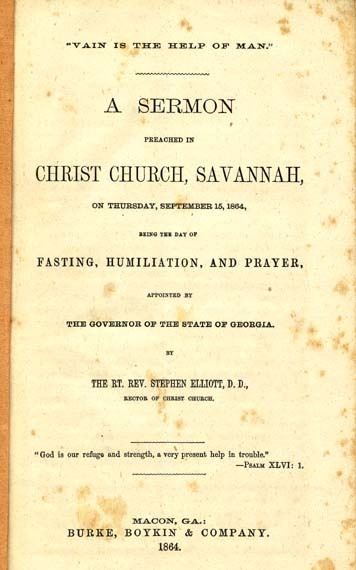 Sermons, American -- Georgia -- Savannah. Georgia -- History -- Civil War, 1861-1865 -- Sermons. "VAIN IS THE HELP OF MAN"
THE GOVERNOR OF THE STATE OF GEORGIA. PSALM LX. VV. 11, 12. Give us help from trouble; for vain is the help of man. Through God we shall do valiantly; for He it is that shall tread down our enemies. the example of the Psalmist and crying unto God to "give us help from trouble," to acknowledge that "vain is the help of man." sister States, and while it is right that we should humble ourselves before God, and implore his help in our day of necessity, it is also right that we should imitate the proud example of those desolated States, and prove that we are worthy to be classed among the sovereignties which can suffer and die, but cannot pass under the yoke of servitude. better for us, as a State, that we should bear our portion of the general suffering, should be able to point to battle fields hotly contested upon our own soil, should have tales to tell in the future which would prove us to have been an heroic race, and not distinguished alone for our powers of acquisition, and our habits of trade. A national character is a most important element in the future of a State, and in no way is it so certainly gained as by passing a people through a fierce struggle, in which they have been brought face to face with suffering and peril. All those States which in the old revolution bore the brunt of the British fury, have to this day maintained their reputation, and have stood conspicuous upon the pages of our public history, Massachusetts, New York, Virginia, South Carolina! Their battle fields have made them historical, and they have kindled within them, ever since, a national feeling which has helped to make them conspicuous. It operates upon States, as a line of heroic and renowned ancestry operates upon individuals. Just as the French proverb, "Noblesse oblige," marks the effect upon the individual whom nobility distinguishes, so does the history of a State operate upon its people. Their past requires a present which shall be correspondent with its fame, and harmonious with its character. The eye of the world is upon them; they know it and feel it, and they rise up, under the consciousness, to a level very much above that which, under ordinary circumstances, they should have attained. Even under this point of view, the invasion of our State is not so great a calamity as many feel it to be; individuals may suffer deeply, but the State may be elevated immeasurably; our fields may be sown with blood and desolation, but the harvest may be one of national character which shall bless us for long generations. Germany, when Körner awoke his people to resistance by the magic of his song, and the Father-land was free! There is no inconsistency, my hearers, between saying that, "the help of man is vain," and "that it is God who is to tread our enemies under foot," and yet calling upon our people to awake and buckle on the armor of heroic citizenship! God works by means; we must not expect in these days, to receive help from Him through miracle. He will help us in time of trouble, but through ordinary means. He will help us by giving us strength in the day of adversity; by opening our hearts to sustain our Government; by quelling dissensions among ourselves; by infusing courage into all those who are weak-minded and timid; by confounding the devices of our enemies. These are the ways in which he now manifests himself, and it is for these ends that we are called to fast and to pray this day. If any one expects that the results of this humiliation will exibit themselves in some extraordinary shape, he will be sorely disappointed. If any results flow from it, and they will be dependent upon the sincerity and faithfulness with which it is observed, they will come in the shape of renewed faith, of enlarged hope, of fresh confidence, of reviving courage. They will be seen in the readiness with which our people will rally around the Government-- in the healing of dissensions among our authorities--in the decrease of selfishness--in the determination of every one to do his part, whatever it may be, in flinging back, into the face of our enemies, his insults and his cruelty. These are the legitimate consequences of humiliation and prayer, because these are the means which are natural and which God is accustomed to use in these days when miracles are no more required. Our text combines the two very beautifully. "Through God we shall do valiantly," is its expression. It is we who are to do valiantly, but yet it is through God. And so shall we find it. He means us to work out our own deliverance, but to work it out in subjection to his will and in subservience to his purposes. He will be the sovereign ruler of his people, even while he may be guiding them to their heart's desire. seen, must it be God who shall tread under foot our enemies. It is a conflict involving the future of a race, whose existence or extinction depends upon its result. The white race of the South, even though subjugated might continue to exist, to live on for a time in shame and degradation, and at last to commingle, as the Anglo-Saxons did, with their Norman conquerors. But the black race perishes with its freedom. They will die out before the encroaching white labor of Europe, which will be poured in upon them, as the Indians have died out before the progress of civilization, or they will be banished to other lands to perish there, forgotten and unlamented. The Puritan code of mercy has always been the harsh one, "If you cannot do for yourself you must die." If God therefore has any meaning in his past dealings with this race, in permitting it to be brought here, to be preserved, to increase, to be civilized, it is not his purpose that they should be given the liberty which their pretended friends are seeking for them. To protect them, he must protect us, and therefore is it, as I have said again and again, that I have full confidence in the successful termination of this conflict. What we may suffer in the struggle is one thing; the end of the struggle is quite another thing. And looking at it in this light I am not disturbed by temporary successes or defeats on the one side or the other; nor am I elated by appearances which seem to promise us any help from man. This is God's war; he has conducted it upon very remarkable principles; and he will terminate it in his own way and just when he thinks that the ends have been worked out which He designs to fulfil. Let us consider these points before we close. slavery. Now was the time for this glorious work! The South had laid itself open to their assaults by her secession, and the axe must be laid at the root of the tree. This war, continued now for more than three years with unparalleled bloodshed, is the mode in which God is accomplishing his purposes. Our punishment is, as I said to you a few Sundays since, a dispensation of death. This war has produced no results but slaughter and bloodshed. God has conducted it upon such principles, as that while death has reigned triumphant, no permanent success has crowned either side. All its great battles have produced no results looking to any settlement of this dispute. At the first battle of Manassas we gave the enemy a shameful defeat; disgraced and panic stricken he fled to his Capital; and we held victory in our grasp, but it was fruitless in its consequences. Our great defeats in the West, the capture of New Orleans, the overrunning of Louisiana, Arkansas and Mississippi, have in like manner been fruitless in their hands. We have recovered almost every thing which we lost, and all that remains of those bloody fights are the graves which furrow the banks of the Mississippi and the bones which are bleaching upon its plains. The wheel of fortune again turned in our favor, and Lee's great victories in Virginia, in 1863, were rendered without permanent benefit by our failures on the other side of the Potomac. We reaped a harvest of death and nothing else. And so will it continue until God's wrath is satisfied, and therefore have I not been disturbed by our recent reverses. They mean blood and death and nothing more. Subjugation is as far off as it ever was and never can take place, for God's other purpose interferes with it, and his purpose must rule. changes of the struggle, and never yet has offered violence to those who have had charge of him. Their quiet has been wonderful even to ourselves, and has caused the world not only to wonder, but to reverse its settled judgment about their treatment and condition. And how sad has been their fate since they have been beguiled and betrayed into the hands of their so called liberators! The husbands and sons perishing by thousands upon the battle field, and the wives and mothers and little children sinking into inhospitable graves with none to care for them or watch over them. I will venture to say that of the negroes who have fallen under the dominion of the Federal armies, more than one-half of those who have been deprived of the protection of their masters have already perished. The world even now sees and acknowledges that the slaves have gained nothing by their emancipation, and are beginning to be satisfied that it has made a grievous mistake in attempting to remove these people from their normal condition of servitude. is an administration which would come with kindness on its lips, and reconstruction with our ancient privileges in its hand. I fear our people would not have virtue to resist it, and we should be linked once more to that "body of death." What we require is such fury as Grant's, such cruelty as Butler's, such fanaticism as Sherman's. It is men like these who revive our courage, and reanimate our efforts. We see that we have nothing to look for but degradation and outlawry; that we must fight, or else give up every thing that an honorable man holds dear--not only our property, but our caste--not only our sovereignty, but our personal freedom. When we realize fully what our future condition is to be, and Lincoln's re-election will make us realize it, then shall we be fairly aroused, and must make the choice between a perpetual resistance, if necessary, and a condition of serfdom, in which we and our children shall be made "hewers of wood and drawers of water," to the paupers of Europe, the negroes of Africa, and last and lowest of all, to the Black Republicans of the North. If any of you are ready for that, I am not, and therefore I cry unto God to help me in trouble, "for He it is who is to tread down our enemies."